Tuesday Dec. 25 - CLOSED Merry Christmas! Wednesday Dec. 26 - CLOSED Happy Boxing Day! Friday Dec. 28 - reg hrs - yarn specials - stay tuned for more details!! Sunday Dec. 30 - Tuesday Jan 1 - CLOSED Happy New Year! If you are familiar with Ysolda Teague then you'll be happy to know we carry her patterns and books. 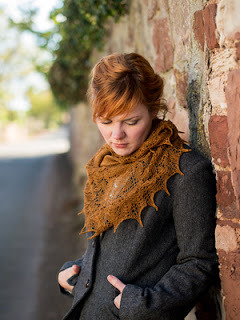 One pattern called Ishbel, a gorgeous lace shawl has over 11,000 projects on ravelry and 4,800 knitters have queued it as a project for the future. My friend hasn't decided what to do with her sweater, but she's the type of friend we all want to have. In this case, one who gives you the sleeve off their sweater.